It is really feeling like Autumn here and I love it! 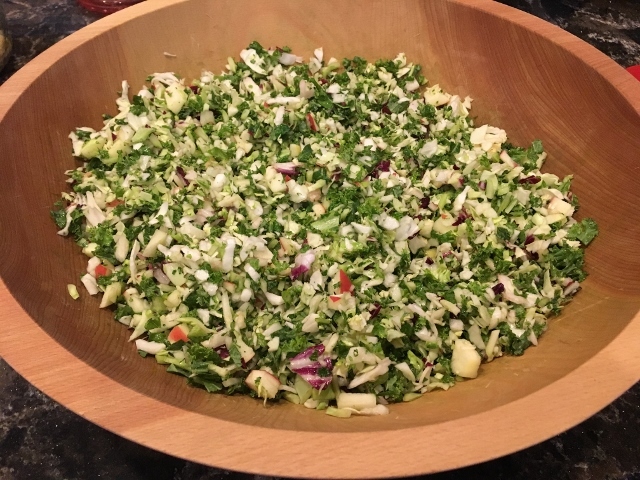 I have been making this crunchy Sweet Apple Kale Slaw to serve along side our soups and stews. I pair this salad with my recipe for Hearty Lentil Vegetable Stew – which is getting rave reviews from my readers. 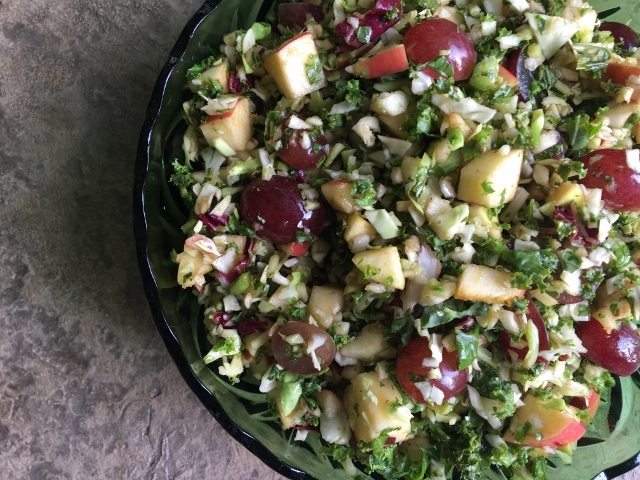 The addition of apples and grapes makes for a special slaw that only needs a little sweet balsamic vinegar as a dressing. This is a quick and easy recipe to make and everyone I serve it to likes it. It’s nice to have some easy recipes that are company worthy. This salad is best served the same day it is made. However,we usually have some leftover that we do eat the second day – it’s just a little less crunchy the second the day. 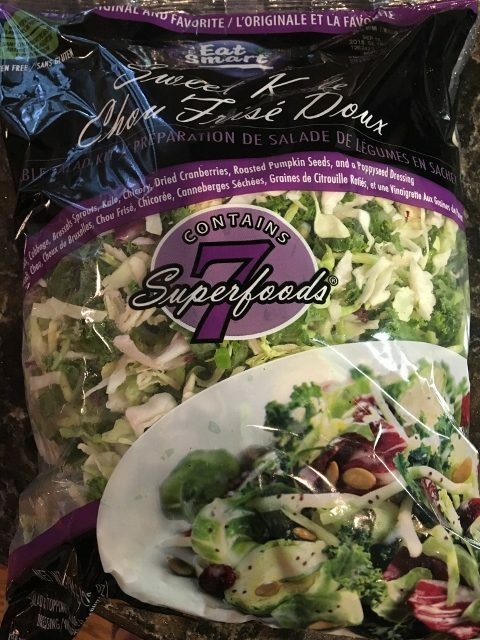 For the base of the salad it’s super convienent to use this Sweet Kale salad mix from Costco. It comes with a dressing and a packet of dried cranberries and pumpkin seeds and I toss both of those as they are loaded with oil and sugar. The salad portion includes broccoli, Brussels sprouts, kale and chickory. If you don’t have a Costco near you try using Trader Joe’s Cruciferous Crunch and add a little broccoli slaw to it. If you don’t have either a Trader Joe’s or a Costco you could make up your own mix with some raw Brussels Sprouts, kale, red cabbage and broccoli slaw. It doesn’t have to be exactly the same you just need about 20-24 ounces of raw crunchy veggies suitable for a slaw. Toss the sweet kale mixture into a wood chopping bowl and finely chop it. I use my 15 inch solid Beechwood bowl from Holland Bowl Mill. Check out my blog post and video where I show you all about my wood bowl for chopping and show you how to make the best salads ever. Big Beautiful Chopped Salads. I am an affiliate with Holland Bowl Mill and if you use my Holland Bowl Mill link to make a purchase with a minimum $125.00 order they will include a free mezzaluna knife in your shipment! Holland Bowl Mill will engrave the bottom of your bowl for free! With proper care these bowls will last a lifestime. They are heirloom quality and proudly made in Holland Michigan. They make amazing gifts for weddings, anniversaries and birthdays. 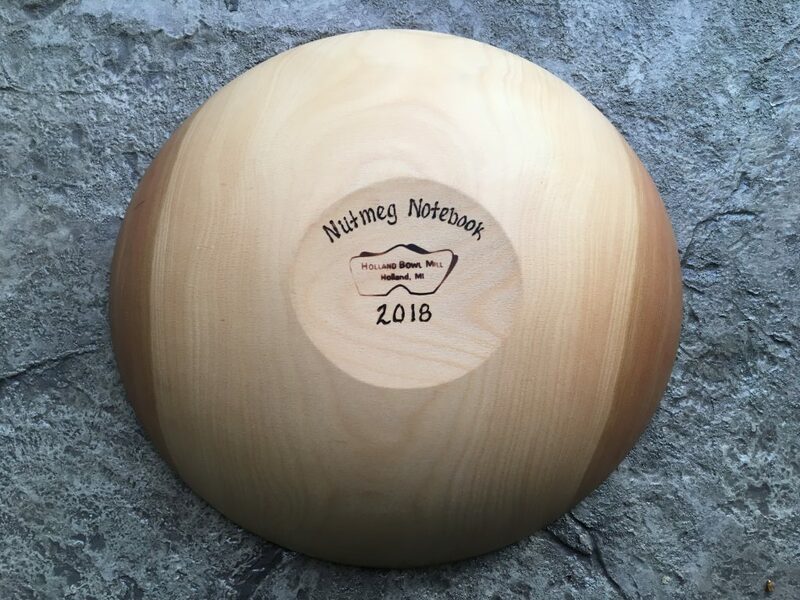 You can have the bottom engraved with a name and or date – I just love that! Holland Bowl Mill Affiliate Link. To the chopped slaw I add 2 diced apples and 2 cups of sliced grapes. All it needs now is a little sweet balsamic vinegar. The key here is to use a reduced thick and syrupy balsamic vinegar like this Napa Valley Naturals Grand Reserve Balsamic. It is only 4% acidity making it a sweet balsamic. I find it at Whole Foods and Sprouts Farmer’s Market. You can also order directly from the company. Just be sure to get the Grand Reserve balsamic. Of course if you have a sweet flavored balsamic that you love use it for this salad! Put the bag of kale salad mix in a 15 inch wood bowl and chop it with a mezzaluna knife or an Ulu knife. If you don’t have a big wooden bowl use a large cutting board and a sharp knife to chop the salad finely. Stir in the diced apples and cut grapes. Add 2-3 tablespoons sweet balsamic vinegar – how much is an indivivual taste preference. *The Sweet Kale Salad mix from Costco includes broccoli, Brussels sprouts, kale and chickory. If you don’t have a Costco near you try using Trader Joe’s Cruciferous Crunch and add a little broccoli slaw to it. If you don’t have either a Trader Joe’s or a Costco you could make up your own mix with some raw Brussels Sprouts, kale, red cabbage and broccoli slaw. It doesn’t have to be exactly the same you just need about 20-24 ounces of raw crunchy veggies suitable for a slaw. 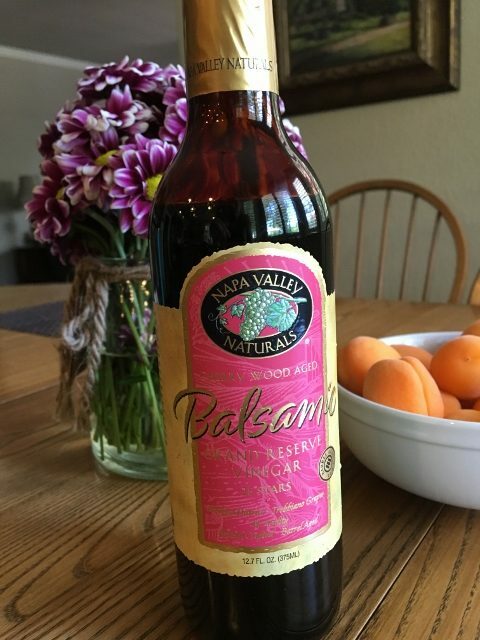 **The key here is to use a reduced thick and syrupy balsamic vinegar like this Napa Valley Naturals Grand Reserve Balsamic. It is only 4% acidity making it a sweet balsamic. I find it at Whole Foods and Sprouts Farmer’s Market. You can also order directly from the company. Just be sure to get the Grand Reserve balsamic. Of course if you have a sweet flavored balsamic that you love use it for this salad! Double the love – diapers – laundry! The twin grandbabies are doing well – they are thriving. Being preemies they sleep most of the time but they are filling out and doing well. Mom and dad are tired as they feed every three hours around the clock! Big sister “Swewet Pea” is adjusting but not sure what to make of these little ones who don’t do much. 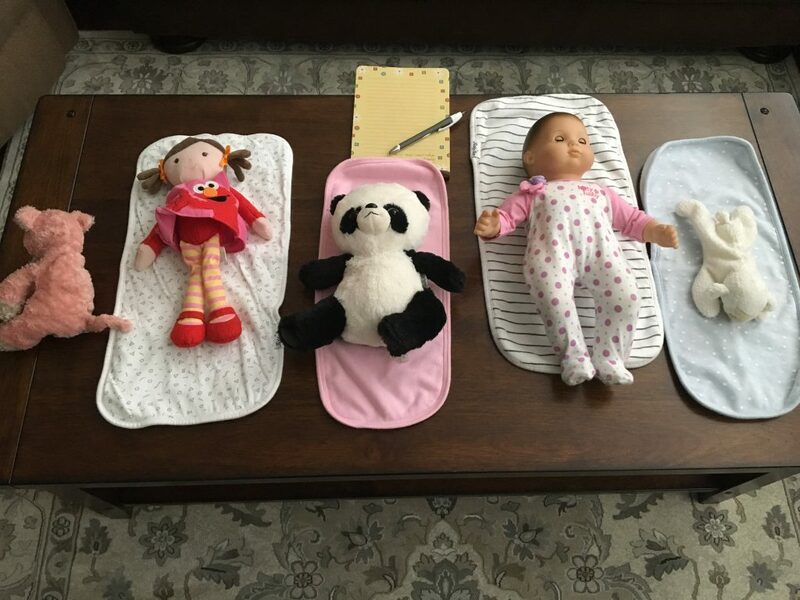 She is watching and observing our every move and setting up her own nursery with her dolls and stuffed animals which is keeping her quite busy! Hubby Tom and I are busy helping them keep the house running smoothly and keeping food on the table. It’s a full time job but we are blessed that we are healthy and have the energy to do it! Thank goodness we follow a whole food plant based lifestyle so we don’t have healthy issues that would prevent us from doing what we need to do. Mentoring helps me as much as it helps others. I am also busy with Chef Aj’s Ultimate Weight Loss Mastery program that just started. This is a more intense smaller group than the larger on line group she runs with Jay Pea. I am one of the mentor’s for the group and will be leading two of the 12 Kale Chats that will be either facebook live classes or conference calls for the private group. This is my second time to work in the Mastery program since I completed the program myself. It is a wonderful way to end the year and I find that I keep learning and growing with this group. In Mastery we up the anty so to speak. Once you get to your goal weight you can’t relax you really have to focus in order to maintain your weight and your healthy lifestyle habits. It truly is a journey and not a destination as we never stop learning and growing. I will also be hosting a local group of ladies that are in the Mastery program and I am looking forward to getting to know them better and sharing the journey with them. When you use my affiliate links you help support the work here on my blog without any additional cost to you. Thank you for your support. Be sure to check out my Amazon Affiliate Recommendation Page where I share with you some of my favorite products used in my kitchen and other areas of my life. Previous Post: « Shayda’s Free Cooking Webinar! You are blessed, and are a blessing. Best wishes for your amazing family. Aaah – thank you so much! Thanks, I will enjoy this recipe! I really want to order that big beautiful wooden salad bowl but it’s a little too expensive for me right now. Maybe for Christmas! The wood bowl is worth saving for! With proper care it will last a lifetime so it is a one time purchase. I made the slaw last night and my husband and I both loved it! He took some with him today for lunch. This will be a regular recipe on our line up. Thank you, Tami! Everything you share is SO helpful and I love learning from videos. Today I need to re-watch Tom’s video on treating our Holland bowls – time for me to oil it. I am so delighted that you both loved the slaw! Thank you for taking the time to leave me a comment – it’s greatly appreciated. It is so important to oil the bowl on a regular basis so it will last a lifetime – it’s really easy. Once you watch Tom do it You will have no problem doing the same. I absolutely love watching your recipe videos. I wish I lived by you to take your classes! Even more I wish you lived in my house!!! Your family is very lucky! I was at the Vegas conference when you were home waiting for the birth and I thought “How lucky is that new mom to have you around to cook all these amazing dishes for her to regain her strength!” I’ve been considering the Holland Bowl purchase for some time now, and I think today is the day! I haven’t tried any of your recipes yet, but it’s on my list to try them all. You are a great teacher! My question is, are the salads in the bags you recommend organic? Our family has been as close to 100% organic for years, and we don’t purchase anything conventional and sprayed. If they are not organic, do you have recommendations that are similar that are? My family is super busy and any already done salad that will take off prep time is my best friend! Thanks!! Tami, I am going to order my Holland Bowl today under your affiliate. Is there a code to get the complimetary mezzaluna knife and engraving? Just wanted to let you know how my husband and I loved this recipe. 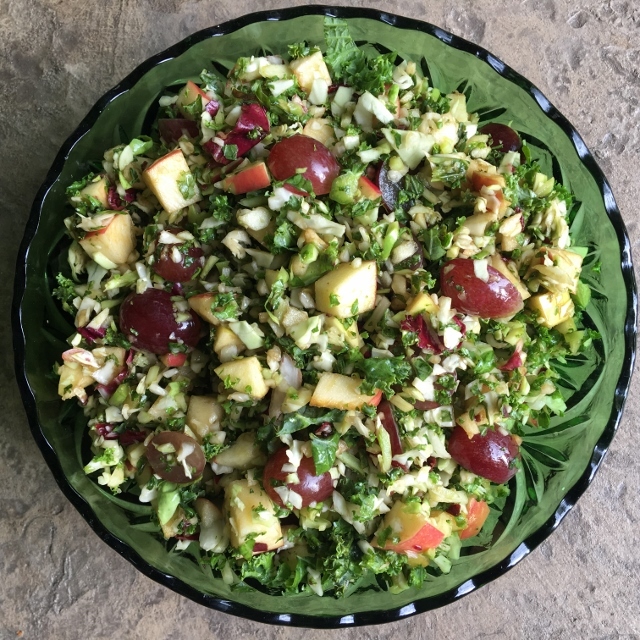 I am not a good RAW food eater, especially when it comes to the heavy hitters like kale, brussels sprouts, broccoli and radicchio; but, this salad has made me a convert! It is going on our Favorites list. Thank you! Also, I am SO enjoying my Holland Bowl! Thank you for turning me on to that! Thank you so much for taking the time to leave me a comment. It is such a delight to know that you enjoyed the salad recipe. It is so refreshing! I love hearing that you enjoy your Holland Bowl. Chopped salads are such a game changer. Such a cute photo of Sweetpea’s babies! Thank you for the recipe. Apples are so flavorful right now. I might be adding some fresh pomegranate seeds as well to the mix since I love them so much. I looked at the website for the bowls and they come in various types of wood. Is there one you recommend over another? What size do you suggest?